George Griffin Stonestreet was born on 22 March 1782 , the son of the George Griffin Stonestreet who set up the Phoenix Insurance Group. George was schooled in London and Ashbourne and joined Jesus College Cambridge in 1804. He joined the church in 1807 becoming the Curate of Ewhurst in Sussex and in 1812 became Lecturer of St Etheldreda, Ely Place , where his journal takes up the story. He joined the army in 1814, at a very interesting period in our military history; serving in Holland during the final weeks of the campaign led by Sir Thomas Graham and then through the momentous Waterloo campaign and subsequent occupation of France . But more than that, George Stonestreet was very adept at pen portraits of the senior members of the Staff he encountered; gave honest opinions of them and was certainly not afraid to criticise! He also ably describes his involvement in a number of major events that occurred; he was on the coach speeding from London to Harwich with news of the fall of Paris in 1814 and describes the wild scenes of jubilation on the roads; he attended the sick at the hospitals following the abortive attempt at Bergen op Zoom and is very critical of Sir Thomas Grahams motives and execution; he accompanied Captain Machell when he walked into Antwerp to demand the keys to the town at the end of the war; he spent the early days of the Waterloo campaign in Brussels helping to organise aid for the wounded and marched with the 1st (Guards) Division to Paris. But perhaps his most famous and unusual exploit, was the arrival at his door in Paris , of Sir Peregrine Maitland and Lady Sarah Lennox who had eloped and wished to be married! A very tricky situation for our poor cleric! He however survived this and was also witness to the celebratory scenes at Brussels on the first anniversary of the Battle of Waterloo, which is a very interesting passage. His journal and letters are also full of other very interesting asides; throwing light onto the period; the selection process and abilities required of a Chaplain to the Forces; the problems of taking gold coin abroad and the ways of beating the customs man; the attitudes of the Belgians and Dutch to the war and the British troops on their soil; the rumours and talk of headquarters throughout the Waterloo period; the problems of getting his allocated troops actually to ever attend Divine Service; and the attempts to bring the church to the numerous emigres living in Brussels at the time. George went on half pay from the army in 1819, having married Mary Elizabeth Shedden in 1817 and became prebendary of Lincoln from 1822-57, of Standon Hall Herts. and Halton House, Hastings where he died on 6 December 1857 . 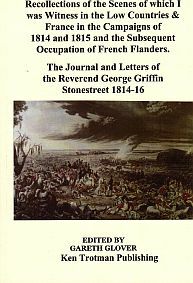 Overall, although on a less orthodox theme, I found the letters and journal of George Griffin Stonestreet enthralling, informative and of great interest and would thoroughly recommend it to anyone interested in this particular period of our military history.